The parliament and, in particular, the government of Denmark on Tuesday, May 12, 2015, gave their support for a motion supporting a democratic and peaceful dialogue between Catalonia and Spain with respect to Catalonia's aspirations to self-determination. During a debate seven of the eight political parties represented in the Danish parliament supported the motion. A vote on the final text was to be be held on May 19. This unprecedented debate by a national European governing body has perturbed the Spanish government which has been trying to counter attempts by the Generalitat, or the government of Catalonia, to promote the cause of self-determination on the world stage. With the actions of the Danish parliament the Spanish government is faced with a situation where a foreign government has given de-facto recognition to the Catalan independence movement. This is something that the Spanish government dreads. Instead of remaining a purely domestic affair the debate on Catalan independence is on the verge of becoming an international affair. This sort of de-facto recognition on the part of the Danish parliament recalls a curious incident that occurred 250 years ago. In that incident a representative of the Dutch government for the first time officially saluted a vessel flying the flag of the United States of America that had recently declared its independence from Great Britain. On November 16, 1776, the brig Andrew Doria sailed into the open and exposed anchorage opposite Fort Orange on the island of St Eustatius, a Dutch colony in the Caribbean. The Andrew Doria was flying the Continental Congress flag, the forerunner of the Stars and Stripes. A few weeks earlier on July 4, 1776, the United States had unilaterally declared its independence from Great Britain. The Andrew Doria, a small converted merchantman, was one of the first four ships of the American navy. As the vessel sailed into the anchorage it fired a thirteen-gun salute, one for each of the thirteen American colonies that had declared independence. In return, and in accordance with international custom at the time, the guns of Fort Orange fired an eleven-gun salute. The man who ordered the return salute was the island's governor Johannes de Graaff. The firing of a few guns as a salute may seem like an innocuous event but within the strict naval customs of the time it had significant meaning. By his action the governor recognised the flag of an independent and sovereign nation, the United States of America. It is very likely that de Graaff's action went against the wishes of the government back in the Netherlands that was wary of upsetting the British. On the other hand, the visit of the Andrew Doria was also of some importance to the tiny Dutch colony. What was generally not appreciated at the time, and remains so even today, was that St. Eustatuis played a small but very important role in the denouement of the American revolutionary war in more ways than one. The incident of the salute itself has over the years turned into somewhat of a legend, yes it did happen, but perhaps it was not the first instance of an acknowledgement of the American revolutionary flag. 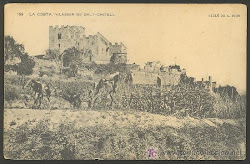 There is some evidence that in October 1776 an American merchantman received a salute from the then Danish island of St. Croix now part of the American Virgin Islands. More recently the St. Eustatius incident was used by the American historian Barbara Tuchman as the opening scene of her last published book The First Salute: A View of the American Revolution (1988) an account of American Revolution's influence on the 18th century. In her book Tuchman wrote that, “In its responding salute the small voice of St. Eustatius was the first officially to greet the largest event of the century—the entry into the society of nations of a new Atlantic state destined to change the direction of history.” Whether the American Revolution was the 18th century's defining event is debatable, the French revolution also comes to mind, but it was certainly significant. And just as certain, the little Dutch colony's response to the American revolution was not without repercussions to itself. 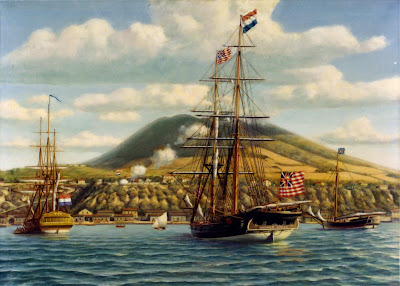 The USS Andrew Doria taking the salute from the St. Eustatius garrison, from a painting by Phillips Melville. She flies on her stern the Continental Congress flag and at the masthead the Dutch courtesy flag. 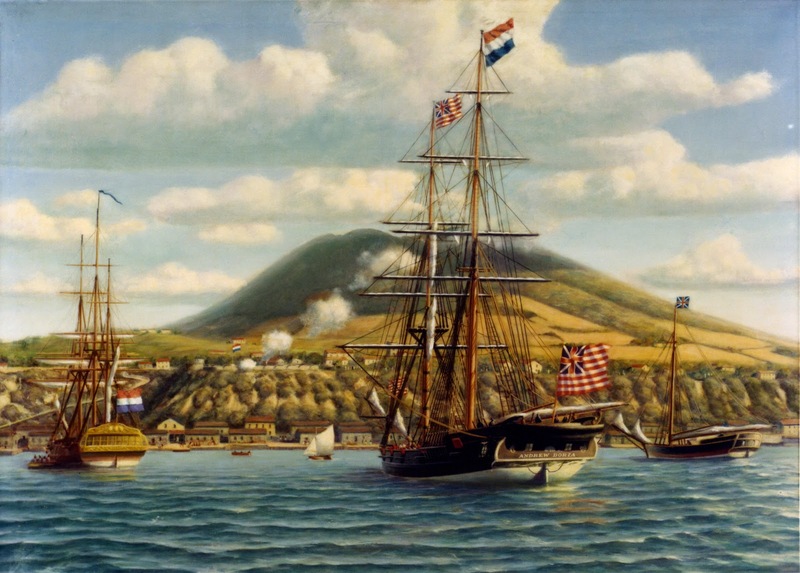 At the start of the American War of Independence the Dutch were of course neutral but their colonies in the West Indies provided the American rebels with one of their few sources of arms and ammunition. The British, who were careful not to set up an arms industry in their restless American colonies lest it fell into the wrong hands, imported their munitions from the mother country. As a result the American revolutionaries had to find overseas sources for munitions. Their problem was that the Royal Navy controlled most of the sea lanes to and from Europe. One of the routes that the British were unable to stop completely was through St. Eustatius. Arms were smuggled from the Netherlands aboard Dutch or other neutral ships to St. Eustatius and then transferred to smugglers for transshipment to the American mainland. The British were aware of this. But, in an age where ships were dependant on the fickle winds blockading the islands was no easy task. This was was especially true since a large part of the British navy was at that moment more concerned with the direct sea approaches to the thirteen rebellious colonies. In fact, the purpose of the Andrew Doria's visit to St. Eustatius was to purchase arms and take them back to the rebels. When the vessel was given an “official” welcome it raised the stakes as far as the British were concerned, and they had to do something. Eventually the deterioration of relations between Great Britain and the Netherlands led to the Fourth Anglo-Dutch War (1780-1784) when the British declared war on the Dutch. Soon after the declaration, in February 1781, the British occupied St. Eustatius when they sent overwhelming naval and army forces to the island. De Graaff who was still governor was at the time unaware that a state of war existed but he surrendered without resistance. There was only a small Dutch garrison on the island and it was no match for the British. Despite the peaceful surrender once in control the British devastated the island. The British also came into possession of the account books of various merchants and discovered to their consternation that some British businessmen had also been supplying the American rebels. The British occupation of the island lasted only ten months because late in 1781 the French, by then allies of the Dutch and of the American revolutionaries, captured the island in turn. Under the terms of peace the island returned to Dutch sovereignty in 1784 under which it remains to this day. When the American Revolution flared up in 1775 the government of the Netherlands was careful of not upsetting the British and did not get involved. However, there was a curious mutual attraction between the Dutch public and the American revolutionaries. Although by late 18th century the Dutch republic was much weakened and past its former glory it remained an inspiration for the American rebels. The Dutch republic had also been born of a struggle against tyranny in this case by decades of war against Spain during the 16th and 17th centuries. For the Dutch who recalled their own wars for independence the struggle of the American colonies fighting for the same elicited much sympathy for the revolutionaries. On the other hand the British themselves did much to garner sympathy for the American revolutionaries in particular by the Royal Navy's high-handed behaviour on the open seas. As the most powerful navy in the world it stopped and searched at will neutral ships much to the annoyance of many governments. There is a common thread between the Catalan debate in the Danish parliament and the incident at St. Eustatius two and half centuries ago. What is in theory an internal “Spanish” affair has suddenly attracted the attention of outsiders. This attention confers to one of the parties a level of legitimacy, of recognition, that the other party has been trying to avoid. Soon after the debate the Spanish embassy in Denmark downplayed its importance. It claimed that all of the Danish political groups in favour of the motion said that the debate between Catalonia and Madrid is strictly “an internal affair” within Spain. Well, perhaps it is, but if more parliaments both within Europe and around the world were open to discussing the claim of Catalan self-determination then perhaps the Spanish government will have to explain its unwillingness to deal democratically with Catalonia's aspirations. After all, the motion in the Danish parliament calls for nothing more radical than for a democratic and peaceful debate. Catalan self-determination only depends on the will of the Catalan public but gaining acceptance from other nations will make it easier to achieve.